This challenging course will be a highlight of your trip. The parkland style layout at The Club at Emerald Hills offers perfectly manicured lush rolling fairways and undulating, contoured bunkers and hills and well protected greens. 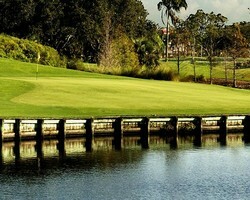 The course features true-rolling TifEagle Bermuda greens and water comes in play on 12 holes. Six teeing areas offers golfers of all levels a great challenge - including the black tees playing to a long 7,238 yards. The Club at Emerald Hills hosts both the Doral qualifier and Honda qualifier, and has played host to such events as US Amateur, US Mid-Amateur and US Public Links qualifiers. Golf Digest has consistently rated the club "Best Places to play" and has been rated "Excellent" as voted by Players in "America's Top Golf Courses" by ESPN and Zagat Surveys. 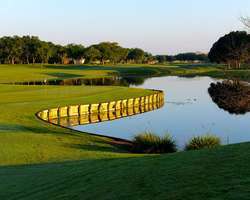 Eagle Trace Golf Club hosted the PGA Tour Honda Classic during the mid 1990s and reason players will see spectator mounds around the course, including natural granstand-type seating carved into the surrounding area of the 18th green. Thousand's of spectators have witnessed final hole drama during the PGA Tour event, State, Regional and Champions Tour Q-School finals. The course layout has many characteristics for a tournament style course - island green, fairways and greens surrounded by wooden bulkheads and great conditioning. Six sets of teeing grounds ranging from Championship tees at just over 7,000 yards to 5,100 yards will challenge and please golfers of all skill levels. All four par-3s require precise shots as water and bunkers protect each green. The signature par-4 13th hole demands a well-struck tee shot as out of bounds and water protect both fairway boundaries, plus a mid-iron shot to an elevated very undulating green. The City of Plantation is known for its warm hospitality, beautiful landscapes and premier residential neighborhoods. Now it will be known for its world-class recreation facilities. Plantation Preserve is a 211-acre natural parcel that includes a 7,000 yard, par 72 championship golf course, a 6,600 square foot club house and a linear park trail with two trailheads that winds its way through the golf course and 29 acres of wetland preserve. 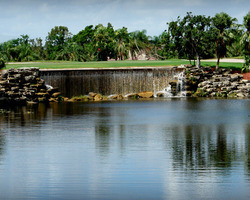 Beginning golfers and seasoned pros will be challenged by the beautiful layout of Plantation Preserve Golf Club. Every hole features 5 teeing grounds allowing players to set their own level of challenge. Plantation Preserve has been recognized for Environmental Excellence by the City of Plantation, Florida and has achieved designation as a "Certified Audubon Cooperative Sanctuary" through the Audubon Cooperative Sanctuary Program for Golf Courses, an Audubon International program.